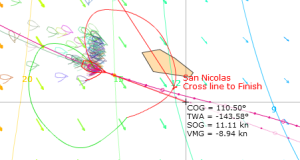 Just before the start, I checked out the final Sprint race of the year, a quick downwind trip off California. 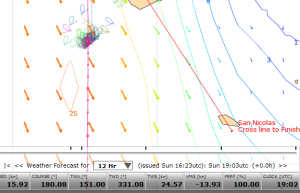 The big pressure gradient looked interesting, and the Class 40 takes off with some wind… A good opportunity for some SOTP fun! 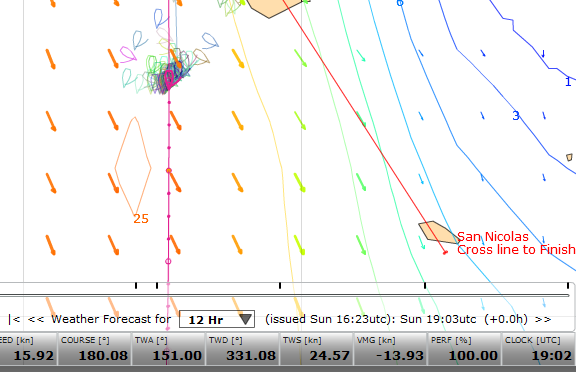 The race distance is 88nm, I guesstimated 8h duration. It looks fairly obvious to sail into pressure, but there’s a catch… TWD for the start is 338, the estimated gybe is TWD330, so one would need to sail away from the shift. What gives? 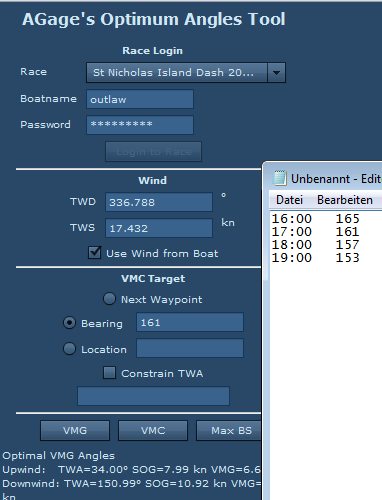 To sail the wrong way vs the shift I need at last VMC338 at the start and get to VMC330 for the gybe. With the steep gradient 8 degrees in 4h is more than reasonable. Well then. I made one big mistake with the late signup, after checking the predictor line and max VMG angles, I realized the gybe would be 3h in, not 4h. 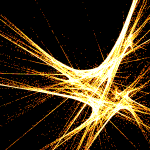 Tentative gybe angle is now TWD333. To allow for nice round numbers I allow for 4 degrees target shift per hour. Gybe target is 153 (333-180), start target is 165 (153+12). Let’s roll!!! The big number is 00:04, right distance, but I wouldn’t quite make it yet. I estimate 00:30 for the finish, with TWD 322, TWS 13.5. I need to move my target east to heat up in lighter air. VMC90 would be optimum across the gradient, but that is too much. Playing around with Optimum Angles I decide to finish around VMC130. 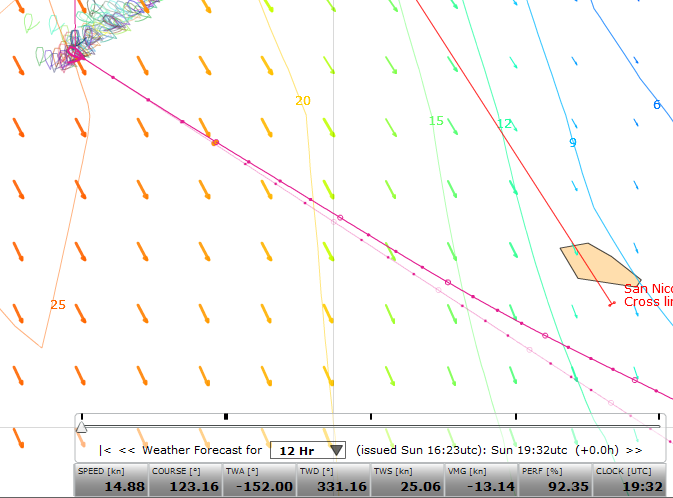 I would finish at TWA142, a 10 degree change from the gybe. My new target bearing is 113 degrees (118-10/2), tentative gybe is 19:40. I get more attentive around 19:25, short after 19:30 I have the 5 degree cushion I wanted. Gybe happens at 19:32. 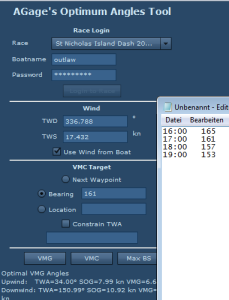 I don’t bother with any performance tricks, boatspeed is only 16kn, not worth the effort. Now I just need to ride it home. I will simply change the TWA at 2 degrees per hour. I have made a small mistake with heating up. My simple math was off somewhere. 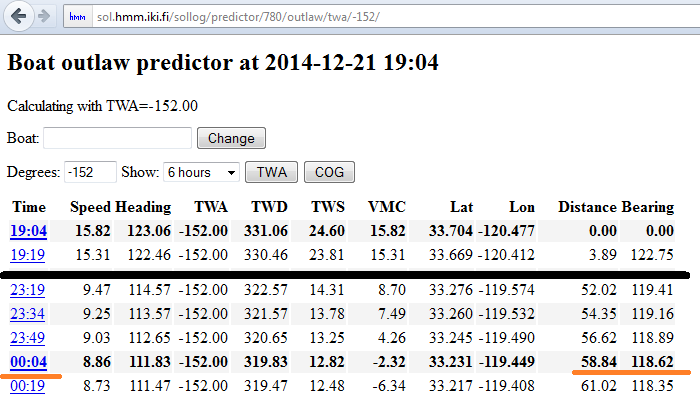 The gap between the finish and the predictor is still 4 degrees. I will finish a bit hotter then expected. Oh well, going fast is a good thing. Current ETA is 23:50, no way am I staying up this long. Nothing much changes. I call it at 22:45, TWA140 to the finish. Just in case, I will set an order to sail backwards just past the line – TWA35. I finished almost 2 minutes behind Winston… can’t beat him on the cheap. My track looks ok, I would have needed to push even harder west in the beginning. My predictions for the gybe are a bit erratic, signing up at the last minute hurt a bit. Overall I’m happy with the result, with some more effort I could have done even better.